Have We Found Our Number One Again? We’re extremely privileged to have the legendary Goonerholic grace our digital pages this week and he’s written something a bit special. The arrival of Petr Čech, and subsequent departure of Wojciech Szczęsny, has thrown something of a spotlight on the goalkeeping position at Arsenal. Since Jens Lehmann lost form and his undisputed number one berth early in 2007-8 a variety of custodians have tried and ultimately failed to claim the job on a permanent basis. One is tempted to say there is nothing new there. When I first started watching Arsenal in the sixties we had a first class goalkeeper at the start of the decade, but a serious back injury sustained in a friendly match for Wales cut short the career of Jack Kelsey in May 1962. Jack had been a fixture for over a decade and, as was the case following Mad Jens’ departure, we had a variety of candidates attempting and ultimately failing to fill his boots. 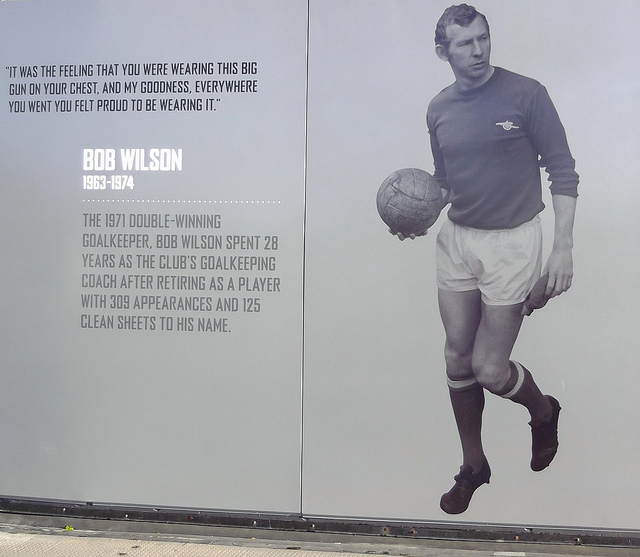 It wasn’t until 1968 that Bob Wilson was promoted and so began a period of six years when ‘Willow’ became a firm favourite, the first of a string of wonderful goalkeepers. Bob relied on positional sense and good hands, but also fairly uniquely among his peers earned acclaim for fearlessly diving lengthways at opposing forwards to more often than not grab the ball in one-on-one situations. Bob was in the Arsenal team that broke a 17 years long trophy drought by winning the European Fairs Cup in 1970, and a league and Cup double the following season. When Bob retired we did purchase an excellent short-term replacement. Jimmy Rimmer had picked up a European Cup winners medal as an unused substitute with Manchester United, and would pick up a second with Aston Villa 14 years later. For three years though the consistent Rimmer was one of the main reasons we were able to preserve our top-flight status as the double side was broken up, somewhat prematurely. The arrival of Terry Neill as manager brought with it the next change in personnel. Neill went back to Tottenham where he had formerly managed and astonishingly secured the services of Pat Jennings. The parallels to the signing of Čech are clear. A prized asset with a London rival snapped up in his thirties. Wilson’s club status is assured. credit David Holt under license. If Čech performs as well as big Pat did, astonishingly for eight years, then we will have got ourselves a player. Pat helped us to three consecutive FA Cup Finals plus a European Cup Winners Cup Final from 1978 to 1980. Nobody who saw him will forget him claiming crosses with just one of the shovels he had where others have hands. By the time Pat retired in 1985 he had already groomed his understudy. Jon Lukic had been signed from Leeds United and proved a capable replacement. Jon was a part of the young side that George Graham managed to the League Cup in 1987, and went on to claim a League Champions medal on that memorable night at Anfield in 1989. Somewhat surprisingly a year later Graham signed David Seaman, once understudy to Lukic at Leeds, and the popular Jon went back to Elland Road. That wasn’t a universally popular decision at the time but it didn’t take long for the unflappable Seaman to win the crowd over. In his first season the Yorkshireman tasted defeat in the League just once as Arsenal came close to the first invincible season of the modern era. The title winner went on to enjoy the Cup double in 1993, and the European Cup Winners Cup triumph in Copenhagen a year later, despite playing the latter with a serious rib injury that required pain-killing injections. So rare were his misjudgments that he will forever be ribbed about ‘Nayim from the halfway line’ a year later in Paris. He would doubtless point you in the direction of his remarkable reaction save against Sheffield United in the 2003 FA Cup semi-final. ‘Safe hands’, coached by Bob Wilson, served Graham and Bruce Rioch before experiencing his most successful spell at the start of the Arsène Wenger era at Arsenal. Doubles were secured in 1998 and 2002, and in his thirteenth and final season as the Gunners number one he won another FA Cup winners medal, his ninth major gong with the club. So how do you replace the man that many would argue was Arsenal’s finest of all time? Only the geekiest of European football followers were familiar with Jens Lehmann, a Bundesliga title winner with Borussia Dortmund in 2002. At the end of his first season everybody knew what Jens Lehmann brought to the team. He was the custodian behind a novice back four of Lauren, Kolo Touré, a converted midfielder, Sol Campbell, so wonderfully coaxed down the Seven Sisters Road on a free, and Ashley Cole, so nearly sold to Crystal Palace but for a bit of a passport issue with Silvinho. The madman and his inexperienced quartet were to prove invincible in the Premier League. Played 38, Won 26, Drew 12, Lost buggerall. Part of his genius lay in his unpredictability. We winced at his occasional forays off his line, although they didn’t always end in disaster. We cursed when he clashed with opponents in the area while the ball was live (yes Robbie Keane, you deserved it, but still). 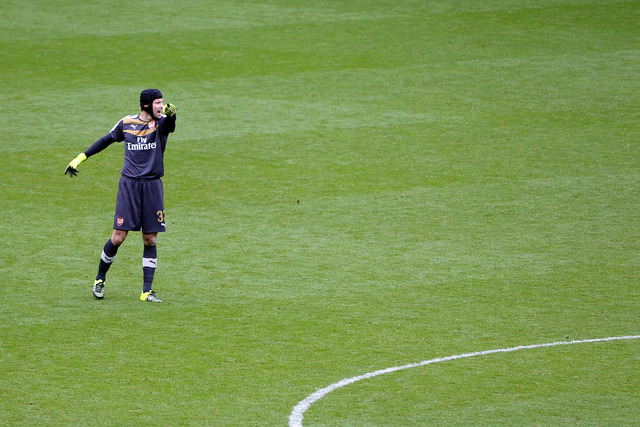 It’s too early to say what Čech’s Arsenal legacy will be. credit DSanchez17 under license. A year later Jens secured an FA Cup winners medal. Not surprisingly in a team that played with Dennis Bergkamp as a lone striker against arguably the most potent Manchester United team of that era he was outstanding that day as we unusually strangled the game and won it on penalties. It was, however, the European Champions League campaign of 2005/6 that will epitomise Lehmann’s career. He didn’t play until match day three, a 2-0 win at Sparta Prague more memorable for Thierry Henry breaking Ian Wright’s goal-scoring record for the Arsenal. That win though did start a run of ten consecutive Champions League fixtures in which we did not concede a goal, largely because of Jens, who was operating for much of it behind another makeshift back four, including midfielder Mathieu Flamini at left-back, and Philippe Senderos at centre-back. That run culminated with Jens saving the crucial last minute penalty from Juan Riquelme at Villarreal in the semi-final, second leg. He was instrumental in securing our first appearance in a Champions League Final, but on an emotional night in Paris he was sent off after just eighteen minutes for a professional foul on Samuel Eto’o. Jens lost his place to Manuel Almunia early in the 2007/8 season, and there began the experiments with the Spaniard, Lukasz Fabianski, Wojciech Szczęsny, and David Ospina that resulted in the unexpected move for Čech. It is too early to say we have, or have not, got ourselves another Pat Jennings. However goalkeepers often improve with age and have a longevity that their outfield counterparts rarely enjoy. At 33 he has time on his side, it would appear. We wish him well, obviously. He has some class acts to follow, however. ‘Holic is one of the true gentlemen amongst Gooners. He’s always got time for new and old fans alike and can be found regularly writing on his own site, Goonerholic.com. This entry was posted in NewsNow, The Bergy Blog and tagged AFC, Arsenal, Arsene Wenger, Bob Wilson, David Seaman, Goalkeepers, Gunners, Jens Lehmann, Pat Jennings, Petr Cech, Premier League, Wenger. Bookmark the permalink.